Find hotel near Saint Spyridon The New Ch .. This 1860 church isn't historically significant in anyway, but it IS architecturally noteworthy. When first built it had significant neo-Gothic influences, but the Patriarch Justinian greatly modified the church's appearance during his time, including replacing the spiral domes with rounded ones. The decor inside is solemn, but also bright and intricate. The stained glass windows are worth a few pictures. Mark the careful detailing on the columns. How popular is Saint Spyridon The New Church? People normally club together Biserica Alba and Templul Coral while planning their visit to Saint Spyridon The New Church. Beautiful orthodox church. I honestly got in to repair from the heavy rain and I found a exquisite piece of art!! Personally I think that here you can breathe the real essence of orthodox churches, silent and peaceful even in the middle of a chaotic city like Bucharest! 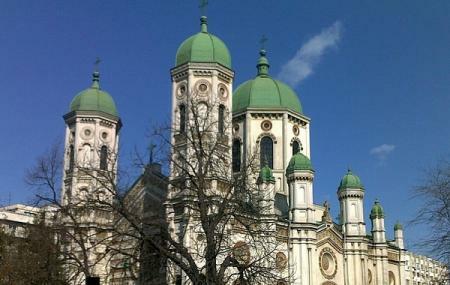 This is the biggest Orthodox church in Bucharest, and maybe the most beautiful one, inside and outside. You should visit it if you have time . A place where you can listen birds' song while you are praying.